The multi-image tie is gorgeous! I love the tie, and I love how easy it is to work with the company. Such a beautiful product and great customer service! I hadn't used this company before and was unsure how the product would turn out. The customer service representative was so helpful and offered to email me the proof for my approval. It ended up being a beautiful product and one that we will surely buy again! 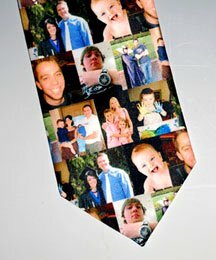 We got our boss for Christmas a tie with multiple pictures of the individuals in our office. He absolutely loved it. Great quality, very pleased, will be ordering again! This tie is amazing! My husband loved it! The quality is great, the images look perfect and most of all the customer service was extraordinary! They went out of their way to get this perfect! I recently got my 2nd (within a year) tie from fotoart. They both look great and are certainly conversation starters. In fact, several colleuges have asked if they could get ones for themselves.